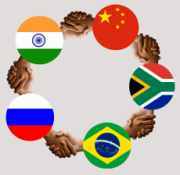 The forth coming summit of the BRICS leaders in New Delhi would focus on stimulating growth to avert the down turn in global economy besides enhancing financial cooperation among the countries, China said. "The BRICS summit will be crowned with success", Chinese Foreign Minister, Yang Jiechi told a media conference in Beijing. Chinese President Hu Jintao was expected to take part in the summit to be held in New Delhi on March 28. "We hope upcoming summit will bring out the active and constructive role of BRICS counties in into international affairs and promote stability on international issues", he said. China is looking forward to promoting bigger and constructive role of BRICS nations in international affairs and relaxation of regional tension so to maintain stability, said Yang at a press conference on the sideline of the annual parliamentary session. China also hopes to enhance cooperation among BRICS members, especially in economic and financial fields, so as to benefit people of these countries and the rest of the world, he added. The rapid growth of emerging economies including BRICS members will be conducive to making the international order more just and equitable, Yang said.